I’d promised myself months ago that I’d become a better writer. Writers write and yet, I don’t always. I challenged myself to live out my story in such a way, that I’d have a story worth writing. Returning — or turning again — is about reflection, about going backwards, about revisiting a spot or memory. Sometimes people think that it can be a negative thing to live too much in the past, drowning in nostalgia. But a lot can be learned by mentally returning to a moment, replaying what happened in your mind, especially if lessons are learned in the process. And so, for one month, I promise to write every day – including weekends. And you my readers, get to return with me. Father Time will be our travel companion. Travel isn’t what it used to be. Sadly, neither is Delta. A friend of mine found himself stranded in Atlanta airport recently and numerous delays (not weather related) and cancelled flights, caused him to miss his first show in over 20 years. My husband travels every month for his job and won’t fly Delta either unless he has no other choice. You might say we’ve been there and done that as well. Being stranded for hours on end is not fun. If you have ever been left hanging by your toes in a Delta terminal, — this post is for you. Enjoy. I would like you to meet the newest addition to the O’Hara household. Her name is Cassidy (From the Grateful Dead), and she is about 4 1/2 months old. We found her in the church parking lot on Sunday Morning, August 14. I couldn’t just leave her there, she’d get hit. With all of the storms we’ve had we thought perhaps she was just lost. We’ve called the vets, shelters, kennels and put up signs. No one has claimed her or even called. Two other puppies with similar markings were dropped off this weekend at the animal shelter as strays. Someone apparently dropped them off near Mohawk park some time last week. That happens a lot. I’ve taken her to the vets to be de-wormed (she has hook worm) and will get her the full puppy shots starting next week. 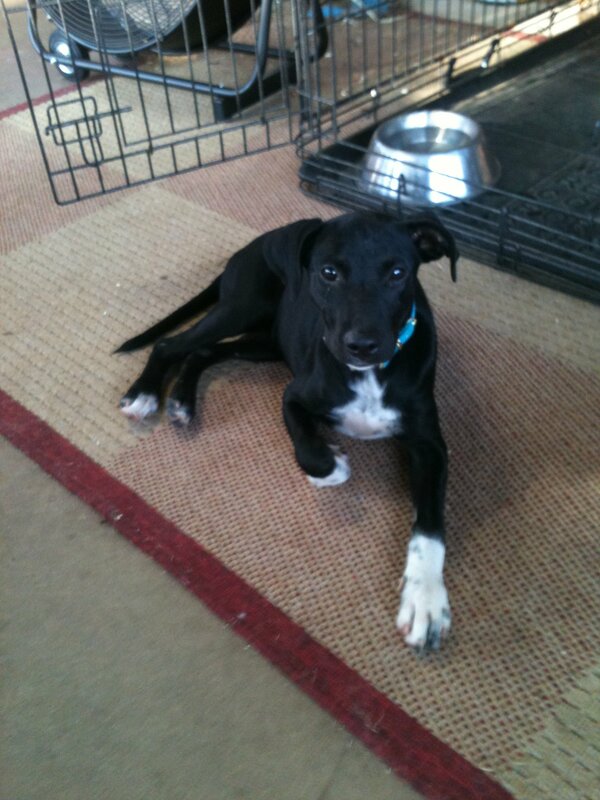 We have a crate for her which she sleeps in and she is safe to be around our border collie at home. The vet was able to put her at 4 1/2 months of age because of her teeth. She has a few scars but nothing seriously wrong with her. She’s small in stature, weighing in at 21 pounds and is only about 18 inches tall. She has webbed feet which suggests a retriever mix of some kind, but she won’t be that big. Her coloring also suggests border collie. She has a voracious appetite and I have to feed her small meals or she’ll eat until she throws up — another sign that she’s been on the street for a few days. She’s starving. I was not planning on getting another dog so soon after putting Sheba down last June, still, a rescue seems to fit our family right now. Welcome to the family Cassidy. 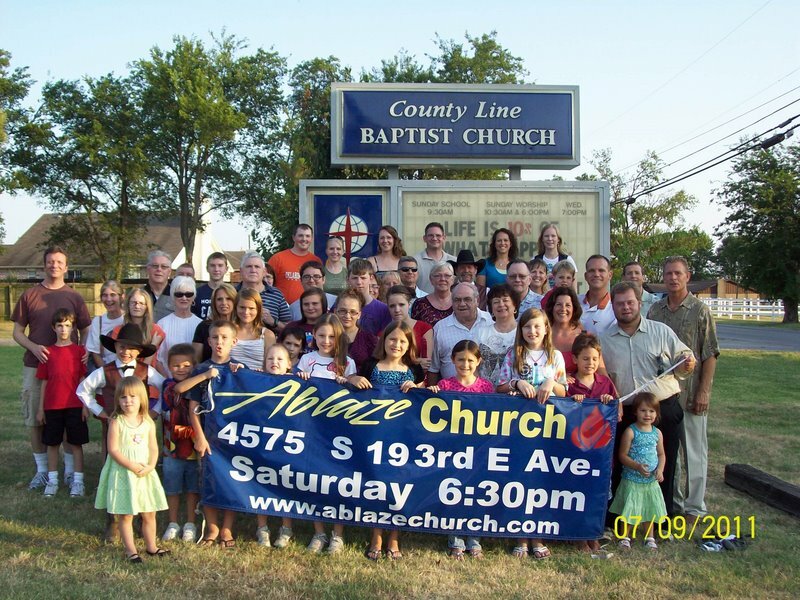 Ablaze Church is happy to announce that we are now sharing space with County Line Baptist Church, 4575 S 193rd E Ave. We still meet every Saturday evening at 6:30 pm. Hope to see you there! Ablaze Church is a mission outreach / satellite location of the Evangelical Lutheran Church of Our Savior, Tulsa. My advice? Cheesy as it may sound, Be More Like Tigger from Winnie the Pooh. Be one of a Kind. – Find whatever it is that makes you uniquely you and bring it with everything you have. Be a real Friend. – He may have gotten on their nerves a time or two, but in the end they celebrated friendships together. Don’t let petty squabbles, busy schedules or misunderstandings get in the way of friendship. Be willing to try new things. – Tiggers definitely don’t like honey, but he did at least try. Who knows by trying new things, you may surprise yourself by finding new things you do like. Be able to Bounce. – The ability to bounce, whether it be forward, backward, up, down or just bouncing back is vital in this life. There will be obstacles to bounce over, disappointments to bounce back from, and goals that may require some bounce to reach. And most importantly I leave you with this thought, it’s not what you do for a living that matters, it’s what you do for a life. This post written by Deana O’Hara, for Redemption’s Heart, August 14, 2011. All rights reserved. 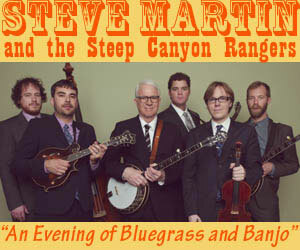 One of my favorite comics of all time, Steve Martin, has been traveling the country with a blue grass band called the Steep Canyon Rangers. My Lutheran pals might have heard them on A Prairie Home Companion with Garrison Keillor. Steve Martin and the Steep Canyon Rangers are coming to Tulsa on August 24 to perform at the Tulsa Performing Arts Center. My more astute friends purchased tickets on time. I apparently live under a rock and did not. It’s probably just as well because just saying his name makes my vocal chords seize up and I squeak. It’s not pretty. Tickets sold in just one day. And there’s none left for me. I’ve even thrown some fits. Is coming here with song. and I think that is wrong. I’ve sniveled, begged, and sobbed. but my husband thinks I was robbed. is coming to our town. while I just have a frown. And now for you listening and viewing enjoyment, below is a video of Mr Martin and the Steep Canyon Rangers. Enjoy. Pathetic whining pays off! — I get to go see them after all. It seems a friend’s daughter and son-on-law are unable to attend and I get to go in their stead. AWESOME! I’ll be honest, I’ve never heard of this guy before. I really like him, and I love this song. It’s Spirit filled, uplifting, and I like the musical arrangement. This is the first single from Jason’s Album, A Way To See In The Dark, slated for release on September 13, 2011. I discovered Jason on a page called Under the radar on Facebook. A friend turned me on to Under the Radar several months ago and I’ve been enjoying their clips of newer artists who fall into their under appreciated status. I love contemporary Christian music and this page has proven to be a wonderful resource. Considering how whiny I got about the hot weather, I thought I’d share something positive with you guys today. Under The Radar is a weekly radio show of under-appreciated music. Offering gourmet music, Under the Radar highlights some of the best undiscovered and under-appreciated tunes from Christian artists. What is gourmet music? Well, a lot of music out there is like fast food but the stuff on Under the Radar is the gourmet variety. It’s the fine steak, not the mass-produced cheeseburger. In this one-hour weekly program, host Dave Trout shares stories, spiritual insight, and exclusive artist interviews to discover the depth of faith and creativity found in the music. Listeners participate by suggesting some of the best hidden gems in their own music collections that the world needs to hear. 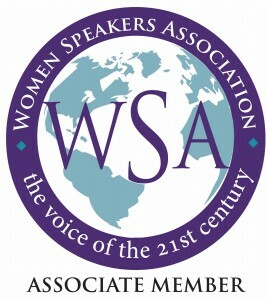 Under the Radar is a ministry of ReFrame Media (reframemedia.com) and Back to God Ministries International. This post written by Deana O’Hara for Redemption’s Heart. August 5, 2011. All rights reserved. No goods or services were given in exchange for this endorsement. I only share resources that I found beneficial and believe my readers will enjoy as well.